Approximately 1.5 million Indian soldiers served in World War One, and over 74,000 of them lost their lives, and a comparable number were wounded. Their stories, and their heroism, have long been omitted from popular histories of the war. This compelling documentary highlights the significant part played by the Indian Army and the sacrifices they made for Britain, only to be rewarded with broken promises of Indian independence from the British government. 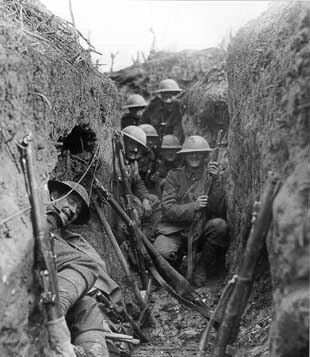 Age did not weary them: the ‘Teenage Tommies’ of WWI. In this moving tribute to the teenage heroes of the Great War, Fergal Keane unearths the most powerful stories of Britain’s Boy Soldiers. As many as 250,000 boys under the age of 18 served in the British Army during World War One, and every tenth volunteer lied about his age. Fergal looks to find out what made them enlist. Were they motivated by patriotism, or the spirit of adventure? Fergal follows the children into the trenches to see how they coped with the reality of war. He explores how, as the casualties began to mount, a movement grew in Britain to get them home. Fergal also meets the children and grandchildren of these former boy solders, uncovering heartrending, but often uplifting, stories and taking them on an emotional journey to the places where their ancestors trained and fought. This documentary made in 1985 comprises a series of interviews with veterans who took part in the Battle of the Somme, July 1916. “Lions led by donkeys” was a phrase used to describe the British infantry of the First World War and to condemn the generals who commanded them. The contention is that the brave soldiers (lions) were sent to their deaths by incompetent and indifferent leaders (donkeys) at the Battle of the Somme. This documentary narrated and presented by Leo Mckern commemorated the 60th Anniversary of the Battle of The Somme. It is a powerfully emotional story, heavily critical of the generals. Leo Mckern Walks the fields of Picardy and retells the story of the battle, with the letters, diaries and memories of men who took part. In November of 2005, In Flanders Fields, a team of archaeologists under the guidance of military historian Peter Barton, seek to uncover the secrets of World War One by finding and excavating a British and a German trench. Digging up the Trenches is a two-hour special that reveals each stage of trench warfare by focusing on the remarkable finds made by this unique excavation. It draws a vivid picture of the lives and deaths of the men who fought on each side of the Ypres Salient, using important historical finds to trigger extraordinary and detailed dramatic re-creations, bringing to life for the viewer the experiences of the men who fought there. The Battle of Vimy Ridge was a major Allied victory that helped turn the tide in the First World War. In April 1917, the Allies began an assault on Vimy Ridge in northern France – but their success came at a tragic cost. A bold and imaginative strategy played out in three dimensions – in the air, on the ground and in a labyrinth of tunnels under No Man’s Land. Travel from heaven to hell on Vimy Ridge through an archaeological dig, opening of a tunnel, live fire tests and demos, personal letters and computer-gaming style animation. A century on from the Battle of the Somme photographer Matt Cardy has put together a series of photos which show how dramatically different the area is now. Matt uncovered a collection of pictures and video from the Getty archive taken at the time of the battle in North-East France in July 1916. He then returned to the same places, took new photos and video from the same viewpoints and digitally merged them. This is a fitting tribute and poignant reminder of the horrors of World War One. This two-part BBC series from 2005 interviewed many of the last surviving British veterans of the First World War. With some emotive reconstructed footage, and much outstanding archive materials, the films enabled those old gentlemen to express for the final time their memories of the conflict. Uploaded for educational purposes only. This is the second part of the outstanding short series that interviewed the remaining ‘Tommies’ in 2005. Uploaded for educational purposes only. This documentary explores the planning, operation and ultimate failure of the attempt at the Dardanelles to force Turkey out of the Great War. It also explores the lessons learned and how they were applied to the D-Day landings in 1944. The documentary has been uploaded for educational purposes only. Any advertising that appears is beyond my control. The Lost Battalion is the name given to nine companies of the United States 77th Division, roughly 554 men, isolated by German forces during World War I after an American attack in the Argonne Forest in October 1918. Roughly 197 were killed in action and approximately 150 missing or taken prisoner before 194 remaining men were rescued. They were led by Major Charles White Whittlesey. On 2 October, the division quickly advanced into the Argonne, under the belief that French forces were supporting the left flank and two American units including the 92nd Division were supporting the right flank. Unknown to Whittlesey’s unit, the French advance had been stalled. Without this knowledge, the Americans had moved beyond the rest of the Allied line and found themselves completely cut off and surrounded by German forces. For the next six days, suffering heavy losses, the men of the division were forced to fight off several attacks by the Germans, who saw the small American units as a threat to their whole line. In the Remembrance Day special “Canada’s Soldier,” Peter Mansbridge retraces the steps that Canadians took as they were dispatched to fight in the First World War. Many memories from the Great War remain cloaked in mystery, including a tunnel with Canadian artefacts never seen before on TV. Michael Palin tells the story of how the First World War ended on 11th November 1918 and reveals the shocking truth that soldiers continued to be killed in battle for many hours after the armistice had been signed. Recounting the events of the days and hours leading up to that last morning, Palin tells the personal stories of the last soldiers to die as the minutes and seconds ticked away to the 11 o’clock ceasefire.